As November draws to a close, that means that we are not too far away from the winter months. Some parts of the country have already seen significant snow accumulations. 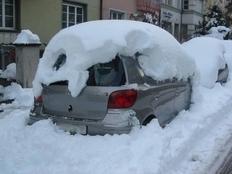 Therefore, you want to make sure that your car has been outfitted for the winter, so that you are better equipped to handle whatever Mother Nature has to throw at you. Below are a couple of steps that you can follow to get your ride ready for winter. ~ Have a mechanic make sure that the following parts of your car are in good condition: Defroster, brakes, heater, thermostat, battery, and antifreeze level. ~ Check your tires to make sure that they have sufficient treads. If they don't, consider replacing them with tires specifically made for winter weather conditions. ~ Actually check out your car's lights. One way to prevent yourself from getting into an accident during the winter is to always be seen. Shorter periods of daylight combined with snow decreasing your visibility create potential dangers. If you need replacement LED bulbs, you can find them on our site. ~ Also check out your windshield wiper blades. If they are worn, get a new pair. They do make blades that are designed to cut through winter conditions, so it would be advisable to look into such a pair. ~ Make sure that your spray nozzles are not blocked and that they provide you with a steady stream. Also fill your fluid washing reservoir with a washing fluid that has the ability to melt ice. With these tips, your car will be better suited and ready to go once the winter weather arrives.